TV wall brackets, what’s available and what’s right for me? 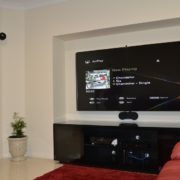 Wall mounting a TV, especially large TV is a great solution and is essential for a well presented home theatre system. 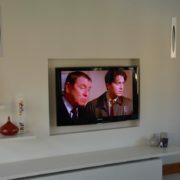 These days any size TV can be wall mounted as long as all the necessary criteria’s are met. 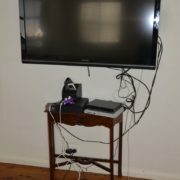 There are many reasons why wall mounting a TV is required and one good reason would be to hide all the ugly cables and leads, from a safety aspect it would be to keep little finger touching the screen and preventing the TV falling forward onto a child an, many children have been killed from this type of accident. One problem is, with so many TV brackets on the market, which one is the best one for you? First off knowing what the construction of the walls are is important, either timer of steel framed, if it’s timber, great, no problems at all, we’re able to use any bracket you’d like, brick is great as well but we’ll have problems running the cables to keep it out of sight. If it’s steel, you’ll be limited to what kind of brackets can used due to the weight of the TV, but if it’s a small TV you’ll be able to get away with almost any bracket. Picking out the right TV bracket is essential and can be narrowed down by answering the following questions. So what is the TV size? The size of the TV will dictate the size of bracket, of course the price of the bracket as well, although we can fit a large bracket onto a small TV, who wants to see the bracket poking out from either side of the TV? In the past you could say that there were 2 different sizes of brackets but now that TV’s are coming up to the 100” in screen size, there are basically 3 different size brackets to accommodate all the new larger TV sizes.